Last week I looked at who races at the Ironman World Championship. This week I’m going to expand the scope of that review and look at who races Ironman. 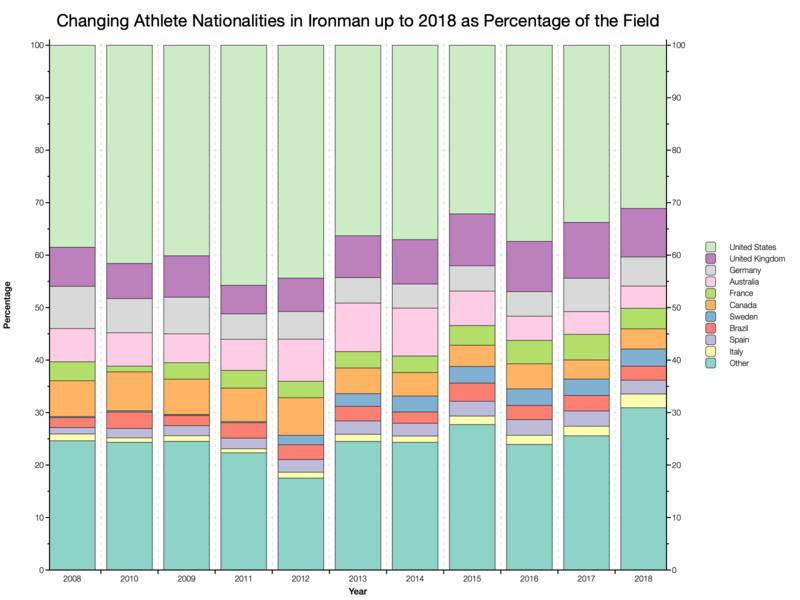 Again considering the gender, age and nationalities of the athletes at any of the Ironman branded events of the last decade. As with the last demographics post, you can find the stats for performance and qualification elsewhere. This article is more about the people who race. I have grouped races by Kona qualification year. This means a 2010 race is any race that came with qualification slots for the 2010 Ironman World Champs. I chose this approach as it then neatly aligns statistics with the previous Kona demographics. It also avoids some issues with race date changes. I’ve combined two graphs in the above chart. 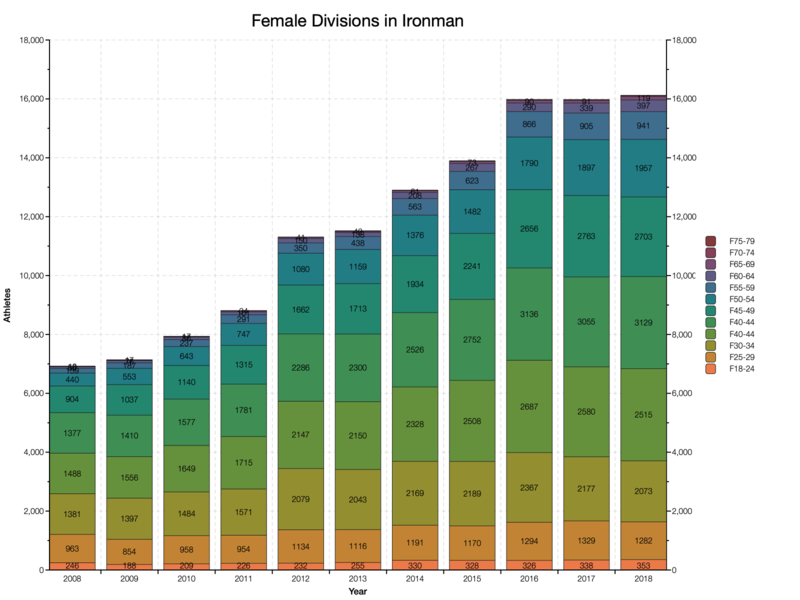 The first looks at the absolute numbers of men and women racing Ironman events over the last decade. 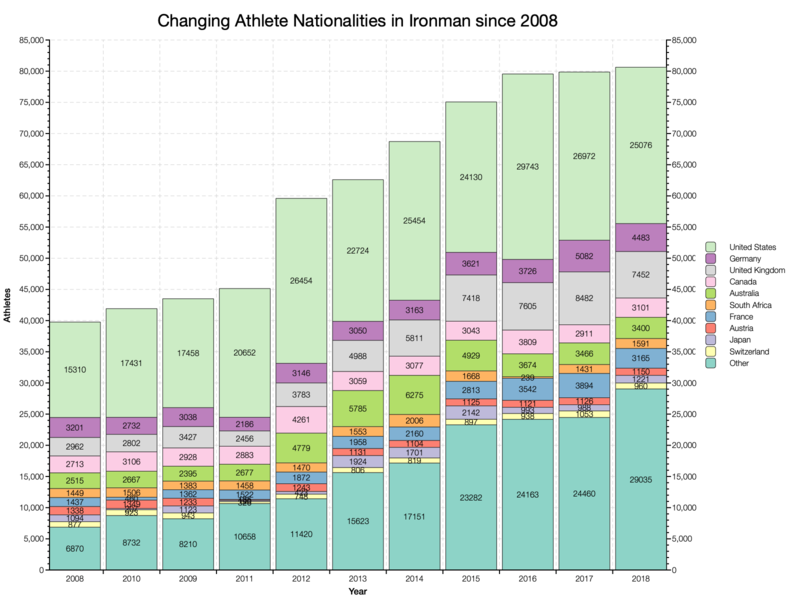 We can see the growth in Ironman, particularly with the jump in 2012. That growth is present in both the male and female field. The second graph of percentages makes this clear: women have consistently made up 20% of the Ironman field. 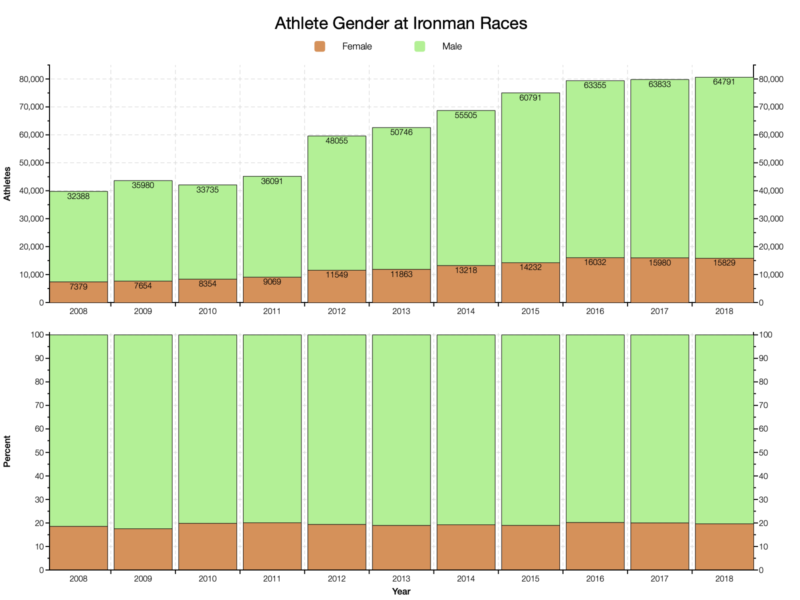 Growth appears to have stagnated for both genders in the last three Kona qualification seasons. Athletes race by age group – that’s where the competition takes place. My review of Kona data showed that most growth at the world champs took place in the older age groups. Given qualification slots are in some way proportional to age group numbers we should expect a similar pattern across the calendar. All male age groups have grown since 2008, but in the last 3-4 years that growth has stagnated for those under 45. 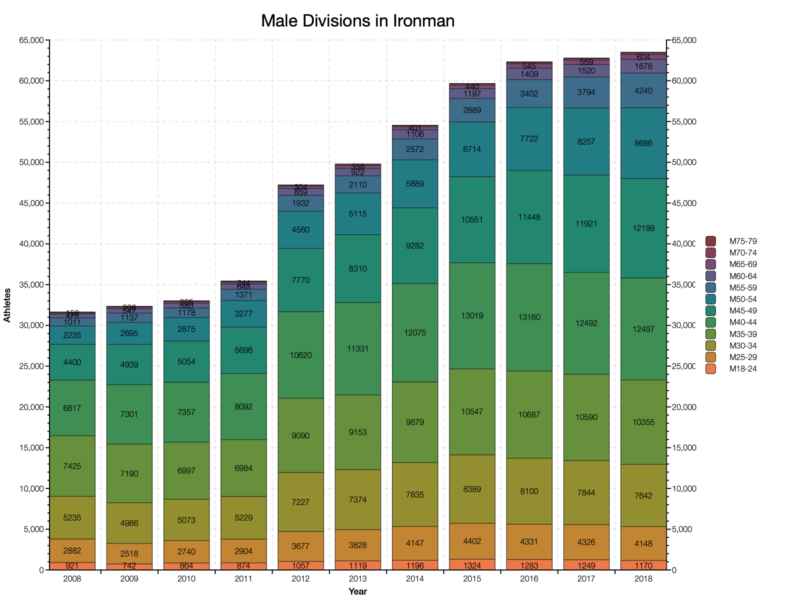 Since 2015 most growth in Ironman races appears to have taken place in M45-49 or above. Numbers are much bigger than a decade ago, but the competitor base appears to be aging. In 2008 around 52% of the field was under 40. In the most recent Kona season that had dropped to about 37%. The over 45s look to account for much of that demographic shift. The women’s divisions have also seen growth and then relative stagnation in the last three years. Age group sizes are slightly more stable than their male counterparts, but still no real growth of late. When we consider percentages here we see a similar pattern to the men. From 58% in 2008 to 40% in 2018 for the under-40s. Growth again mostly focused in the over 45s. The final demographic to consider is the nationalities of athletes. There have always been Ironman races around the globe, but there are far more in 2018 than there were in 2008. That obviously affects the pool of athletes who race. There are too many nationalities to graph them all so I’ve restricted myself to the ten most numerous with the rest grouped into an ‘Other’ category. If we consider the ten most numerous during the 2018 qualification season then we see growth across them all. The pattern of growth varies though. The US are between 2008 and 2012 and has since fluctuated in size. The UK grew until 2015 and has now levelled out. Australia peaked in 2014, its highest numbers coinciding with Ironman Melbourne. Canada has barely grown at all. The growth of ‘Other’ nationalities starts in 2013 and has happened in fits and bursts since. the arrival and departure of races in both new and old locations likely explains this. Shifting to a percentage view and the changes appear more modest. The US has shrunk as a proportion, but only by 7%. This is balanced by Other nationalities growing by 6%. What happens in between varies. There’s another way to consider the changing nationalities racing Ironman and that’s to consider the most numerous in 2008. Not every country that was a big part of the Ironman scene back then is now. There are still a lot of cross over between the two approaches – 6 of the ten largest are shared. Four other nations haven’t seen growth in participation at the same rate though. South Africa, Switzerland and Austria have remained consistent over the years, perhaps reflecting participation in their home race above anything. Japan has fluctuated, its peak numbers coinciding with Ironman Melbourne. The percentage chart isn’t too dissimilar to the 2018 version. Here the growth of the ‘Other’ category is more pronounced though – from 27% to 36%. Other patterns are similar to before or reflect the relatively static numbers of the four previously mentioned countries. 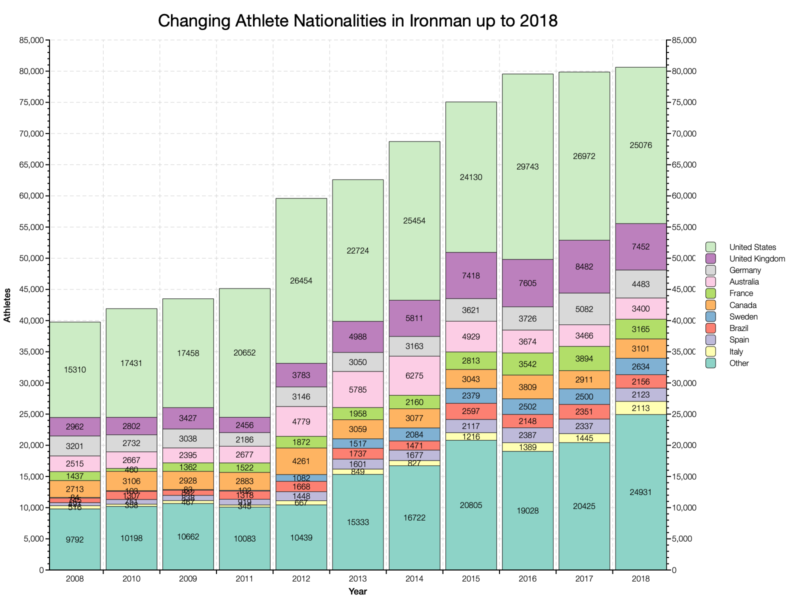 Growth in Ironman participation has certainly added new countries to the list and we also see this in the competitors in Kona. That said, a large element of overall growth has been within the already significant competitor nations such as the US, UK, Australia and Germany. 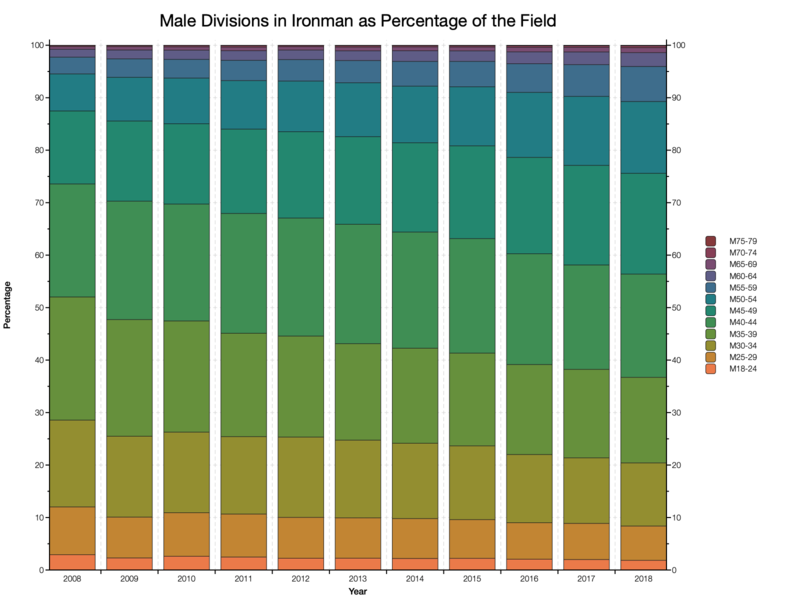 This concludes part one of my examination of Ironman demographics. Part two will return to the same statistics, but also look at they vary around the world.